Powers/Abilities: Stymie is a childhood bully turned small-time criminal with some connections in the underworld. 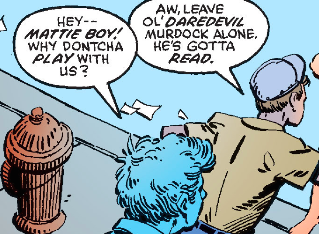 (Daredevil I#191 (fb) ) - Years ago, Stymie and Jocko were among the neighborhood bullies who taunted Matt Murdock for studying so much, calling him Daredevil. Stymie grabbed Matt's text book and ripped out pages, causing Matt to punch him, giving him a shiner. (Daredevil I#203 (fb) ) - Stymie, whose real name was Stewart Schmidt, harassed Matt throughout their adolescence. 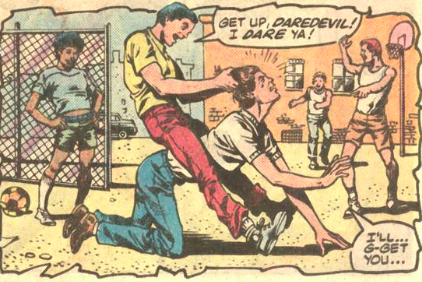 He teased, punched, and cajoled Matt on numerous occasions, always calling him Daredevil. 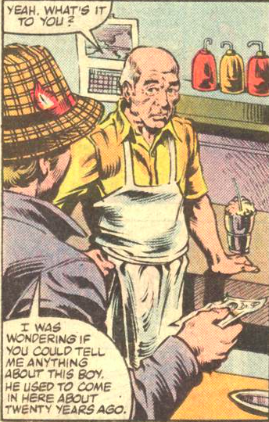 (Daredevil I#203 (fb) - BTS) - At Max's soda bar, Stymie teased Matt frequently. On Matt's first date, Stymie poured butterscotch syrup all over Matt to embarrass him. (Daredevil I#176) - At Josie's Bar, Stymie was playing cards with Grotto and Turk when he caught Turk cheating. Daredevil busted in wanting intel, and Stymie managed to hit the hero on the head with a gun. Josie kicked the men out. (Daredevil I#203 (fb) - BTS) - Stymie took a job working for Trump, agreeing to drive the truck on an arms-dealing caper. (Daredevil I#203) - When Daredevil attacked Trump and his gang, Stymie drove the truck right at the hero and straight into the river. Daredevil saved Stymie, who knew that Trump was furious with him and would be after him now. Stymie claimed he was framed and tried hiring Matt Murdock and Foggy Nelson as his attorneys. When he recognized Matt as the boy he used to tease, Stymie laughed loudly. Matt agreed to handle his case solo, pressing for a case of innocence. 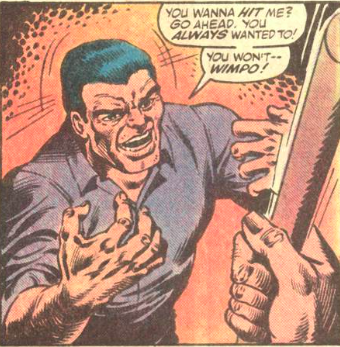 (Daredevil I#203 - BTS) - Trump snuck into the jail and tried killing Stymie with an electric shock. (Daredevil I#203) - Matt found Stymie nearly dead in his cell and revived him with CPR. Later, Matt returned to Stymie, informing him he was turning his case over to a public defender, and Stymie was furious. Matt asked Stymie why he had teased him all those years ago, and Stymie claimed he never even thought about Matt, yelling after the lawyer as he walked away. Comments: Created by Frank Miller and Klaus Janson. (Daredevil I#191 (fb)) - Years ago, Jocko and Stymie were among the neighborhood bullies who taunted Matt Murdock for studying so much. Matt fought back and broke Jocko's nose. (Daredevil I#203 (fb) - BTS) - Max owned a soda shop in Hell's Kitchen, where neighborhood kids would frequently come in to hang out. He saw kids frequently teasing Matt Murdock. On Matt's first date, bully Stymie poured butterscotch syrup all over Matt. Max tried to keep Matt protected. 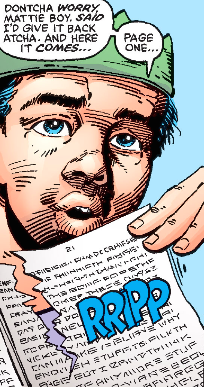 (Daredevil I#203) - Foggy Nelson came into Max's shop asking about how Matt was bullied twenty years before.